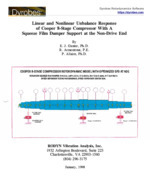 The object of this report is to review the synchronous unbalance response of the eight-stage Cooper compressor with a squeeze film damper mounted at the non-drive end of the compressor. The principal objective of the squeeze film damper is to increase the log decrement of the compressor first mode to increase its stability characteristics. The squeeze film damper also has highly desirable effects on the unbalance response at running speed.